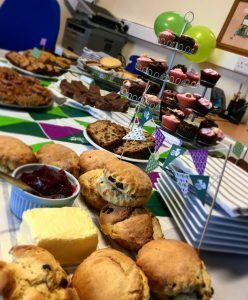 On Friday 29th September, people all over the UK were out in force to raise money for Macmillan, in typical Brit fashion – involving plenty of chatting, coffee and cake! The A. Lamb Associates team were invited to join SJW Accountants at their event, and we simply could not turn down the chance to sample some of the fine cakes and bakes on offer, whilst helping to raise some money for charity. Cancer is unfortunately something that is likely to touch all of us at some point, with one in three people developing the disease during their lifetime. In last year’s event, Macmillan raised over £29.5million to support people facing cancer. With plenty of cake consumed, ALA are very proud to announce that the SJW team successfully raised £351.90 for Macmillan. This is a tremendous achievement in aid of a very worthy cause. What an excellent spread of cakes and bakes to feast on!